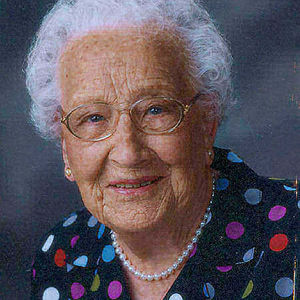 Myrtle E. Daman, 101, Wahpeton, ND, formerly of rural Fairmount, ND, went home to her Lord and Savior on Monday October 8th, 2012 surrounded by her family at McKenna Crossing Assisted Living, Prior Lake, MN. Funeral services will be on Friday, October 12, at 11:00 AM at Immanuel Lutheran Church, Wahpeton, ND with Rev. Morris J. Stephens, Jr. officiating. Visitation will be on Thursday from 6 PM to 8 PM with a prayer service at 7 PM at Vertin-Munson Funeral Home, Wahpeton, ND. Interment will be at St. John's Lutheran Cemetery, Tyler, ND. Arrangements are entrusted to Vertin-Munson Funeral Home, Wahpeton. Myrtle was born September 6, 1911 at Brandenburg Township, Richland County, ND. She attended school in Great Bend, ND, and Wahpeton, teaching after college. She married Arthur Daman on December 1, 1934. They lived and farmed on the home farm. Myrtle was a follower of Jesus Christ, a wife, mother, grandmother, great grandmother, great-great grandmother and an amazing friend. She was a master gardener and an amazing cook. She loved doing crafts, canning, playing cards, quilting and having company. She farmed for many years until Arthur passed away June 26, 1995. She continued living on the farm for several years; finally moving into town in 1993, and not willingly. She moved to the Twin Cities area in November 2010 to be closer to family. She lived in her own apartment and was blessed by her caretakers and family daily. On her 100th birthday, she attended a Twins game and had the entire stadium on their feet as she was featured on the jumbo-tron. Myrtle is survived by her son , Harlan (Sandie) Daman, Alamo, TX; her daughter Joan (Gary) Thompson, Eden Prairie, MN; 5 grandchildren: Greg Thompson, Julie (Marty) Able, Kris (Vark) Tadian, Steve (Kari) Thompson, Michelle (Brian) Gunderson, 14 great-grandchildren: Samantha & Tanner Thompson, Jack & Taylor & Tadian, Tyler, Baron, Tori and Ella Thompson, Vanessa (Rai) Mannique, Par Widlund, Brittany (Chris) Gunderson; four great-great grandchildren: Aidin & Daman Lingasin, and Amelia and Benjamin Mannique. She was preceded in death by her husband, Arthur Daman, and granddaughter, Lori Widlund. Today we celebrate her life. In lieu of flowers, memorials to the St. John's Lutheran Cemetery Fund are appreciated. The beautiful and interactive Eternal Tribute tells Myrtle's life story the way it deserves to be told in words, pictures and video. Myrtle was a wonderful Woman, Wife, Mom, and friend who raised a beautiful family while still having time to visit with so many friends! May your family keep you in their hearts unti we all meet with you above! May God bless all of your loved ones who you have touched throughout your 101 years of life as a child of God! To the Families of Joan and Harlan- Your Mom was such a Kind, Loving, Woman. I only got to know Her from gatherings at the Herb Bohn farm and Sunday afternoon baseball games at Great Bend. She sure lived a Long Wonderful 101 years. She now is with Art in Heavean, what a Blessing to be together again! Gods Richest Blessings to Both of You and Your Families! To the Family of Myrtle, We were so sorry to hear of Myrtle's passing. She was a wonderful matriarch to the Daman family. The celebration of her life hopefully brings comfort to her family. I did Myrtles hair for about 16 years, she was a very special lady and always a joy to spend time with. I missed her very much when she moved to the cities..my fridays were never the same..she will always have a special place in my heart.